The Blue Lotus (Original: Tintin en Extreme-Orient) is the fifth comic of Adventure of Tintin series. The comic published weekly from August1934 to October 1935 at Le Vingtième Siècle for its children's supplement Le Petit Vingtième. The comic is colored in 1945. The download link given here is of colored edition. The Blue Lotus is the sequel of the Cigars of the Pharaoh. After successfully caught the drag cartel and unsuccessfully killing the cartel leader, Tintin was enjoying his vacation with Indian landlord Maharaja of Gaipajama. After getting invitation from a Chinese visitor, Tintin visits to Japanese businessman Mitsuhirato in Shanghai, China. 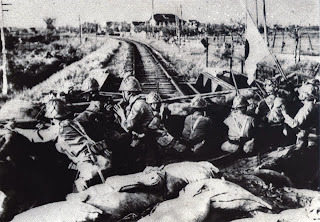 China was on the edge of second Sino-Japanese War. Eventually Tintin had to face both Imperial Japanese plot against China & Japanese Drag Syndicate. In 1931 Japan historically entered a war against China called as second Sino-Japanese War. Japan captured Manchukuo and established a puppet state. The League of Nations condemned Japan for the incursion and as a result Japan withdraws from the League of Nations. You will find every of this incident in this comic. This should the first masterpiece of Hergé. Hergé himself said, "I admit that my early books were typical of the Belgian bourgeois mentality of the time.” Herge early works were based on popular prejudice instead of research. Herge tried to portray China accurately in all aspects. Still one can argue this comic as racist. Herge portrayed most Japanese as an evil, scheming person with stereotypical rectangular teeth!